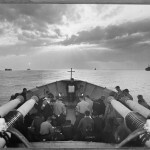 Dale Rooks WW2 & Other Historic Photography | United States Coast Guard Combat Photographer, traveling with the USCG Duane. August 15th, 2014 marks the 70th Anniversary of “Operation Dragoon”, which was the Allied Invasion in Southern France. This was an important operation towards the end result of liberating France. The USCG Duane and Dale Rooks were amongst the Allied Invaders. 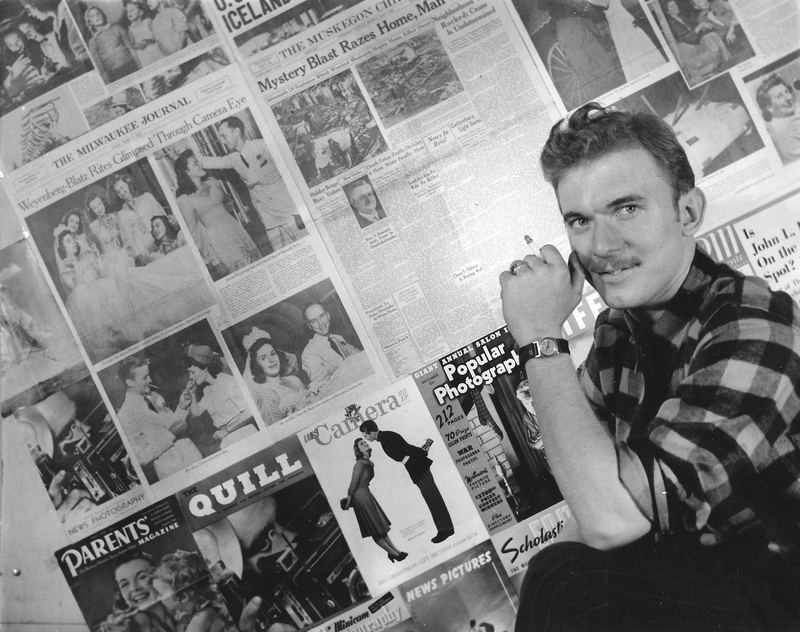 An entire book of Dale’s work is dedicated to this event. As July 1944 came to a close, the Allied advances in Normandy had slowed and the Mediterranean Command had its case to proceed with the much-debated landings in southern France. An invasion armada had been assembling in Naples harbor since mid-June and now Operation Dragoon had the go ahead with General Jacob Devers in command of General Lattre’s French forces and the American Seventh Army as the main assault force. The 3rd Division was assembled at Pozzuoli in July 1944 and readied along with the 36th and 45th infantry divisions to make up the primary VI Corps force for Operation Dragoon. All three divisions had taken part in the Anzio action and the drive to Rome as part of the American Fifth Army but had been ordered to the vicinity of Naples where they would assemble under the rejuvenated Seventh Army. The battles for Italy against the fortified lines of the German army would continue until the German surrender in May 1945. The 3rd Division’s fight in Italy was over as its orders would take it to the beaches of southern France and a long march that would pass through Germany and end in the Austrian Alps. These concrete German pillboxes were captured in Pozzuoli. The 3rd Division assembles on the Pozzuoli parade ground prior to its journey to southern France. The Third, 36th and 45th divisions made up the VI Corps force that passed from control of the American Fifth Army in Italy to the Seventh Army that commanded both the Third and 45th divisions in the battles for Sicily. Newly-appointed Seventh Army commander Brig. Gen. Alexander M. Patch reviews 3rd Division troops with its commander, Maj. Gen. John W. O’Daniel; II Corps commander, Maj. Gen. Geoffery Keyes; and a Naval representative of the Western Naval Task Force. Patch was distinguished for his action of leading the relief of embattled marines on Guadalcanal securing America’s first Pacific Theater land victory in February 1943. 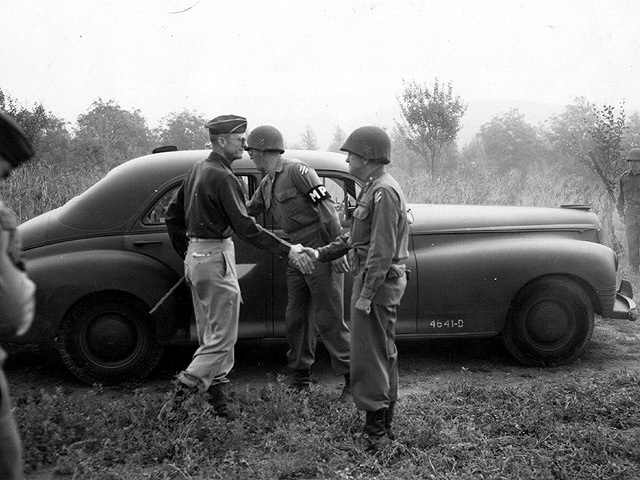 Gen. Patch shakes hands with Gen. O’Daniel after his review of 3rd Division troops in Naples. O’Daniel assumed command of the Third on the Anzio beachhead on Feb. 17, 1944. 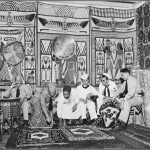 Patch was assigned to the Seventh Army in the Mediterranean after action in the Pacific. He relieved Gen. Patton who commanded the Seventh in Sicily. Ordered to Naples and Pozzuoli in mid-July, 1944, 3rd Division troops and equipment queue for loading Western Naval Task Force transports under Vice Admiral Henry Kent Hewitt. The task force carried three American divisions and support units along with French troops commanded by General Lattre to the Operation Dragoon landing beaches in the French Riviera. 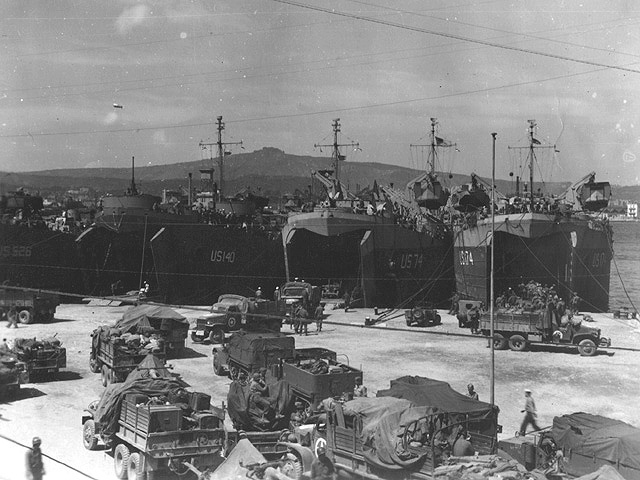 LST’s line Naples’ docks loading elements of VI Corps’ main infantry divisions, the Third, 36th and 45th, for Operation Dragoon. 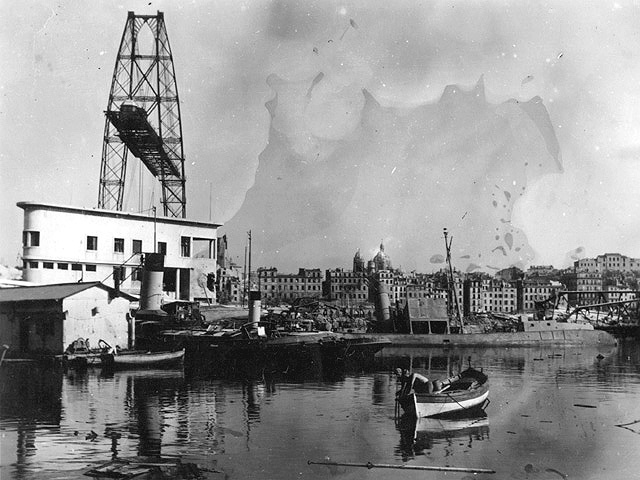 All three divisions had previously embarked from Naples for Anzio. The trucks are queued to back through the massive doors of the ship. 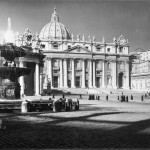 As the invasion force departs Naples in mid-August under the slopes of Mt. Vesuvius, the memories of Anzio’s bloody four-month stalemate for the 3rd and 45th divisions, the catastrophic crossing of the Rapido River by the 36th Division and the 45th’s assault on the Gustav Line below Monte Cassino are still fresh and vivid memories. The 3rd Division consisted of three infantry regiments: the 7th, 15th and 30th. Operation Dragoon was originally known as Anvil to compliment Normandy’s code name of Hammer for a simultaneous assault. Anvil was delayed, scrapped and later revised due in part to the dedication of Lt. Gen. Jacob Devers and the fact that the Normandy breakout was having problems. At 0800 on August 15th landing ships make formation as they begin the journey to the beachhead. More than 90,000 amphibious and 9,000 airborne troops participated in the initial two-day southern France landings at three main beachheads. The slow move of the Italian thrust set the southern France landings back by two months. Three beaches formed the Dragoon plan: Alpha Beaches, near St. Tropez, for the 3rd Division; Delta Beaches in Bogon Bay near Cape Sardineaux for the 45th; and Camel Beaches near St. Raphael for the 36th. French troops (Garbo Force) followed the American units and moved on Toulon and Marseille. The southern France landings were called a perfect landing. Opposition was scattered, allowing for a rapid advance from the beachheads. By August 17, 130,000 men and 18,000 vehicles had crossed the three assault beaches. Initial encounters with the enemy often led to eager surrender. 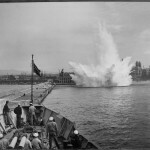 Naval weapons of the Western Naval Task Force under Vice Admiral Henry K. Hewitt lay down a barrage of fire prior to the 7th Regiment’s assault on Red Beach. The armada consisted of 885 ships with 1,375 landing craft that ultimately landed 151,000 troops and 21,400 vehicles. 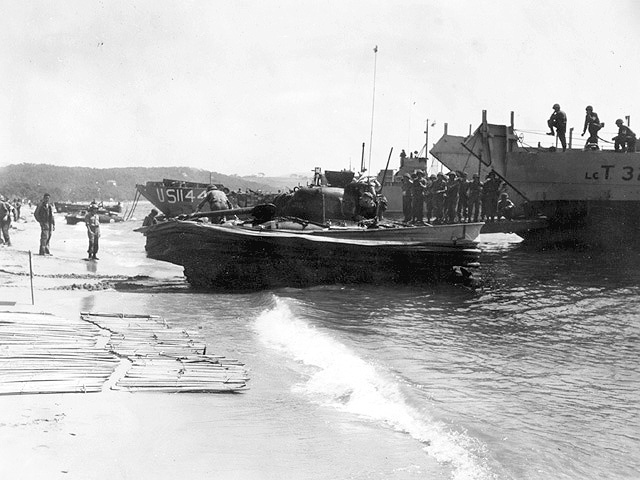 A British-operated LCT turns for its run to the beach. For the 3rd Division, it was the fourth amphibious assault; for the 36th Div, the second; and for the 45th Div., the third. The three divisions made up the American VI Corps under Gen. Lucian K. Truscott. The entire invasion force faced 11 German Divisions in the south of France totaling about 230,000 troops. Beach fortifications were quickly overrun at Red Beach by the 7th Regiment’s Battle Patrols. Artillery, mortar, machine gun and rocket fire met the landing; here a beach dugout was defended by a German MG42 machinegun. The primary goal of the regiment was to secure Cavailare to the west. The 3rd Division faced the German 242nd Infantry Division under the XIX Army (General Friedrich Wiese) of Army Group G (Gen. Johannes Blaskowitz). 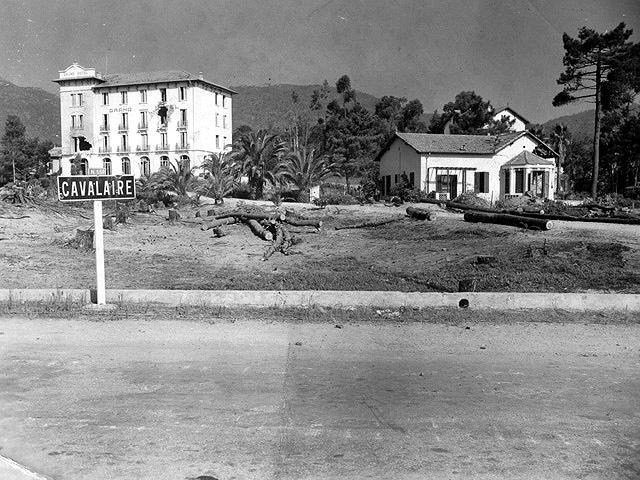 The Grand Hotel at Cavalaire overlooks the Red Beach assault landings. The stiffest resistance for the 7th Regiment was the fire from Cape Cavailaire where 3rd Division Sgt. James Connor’s bravery earned him the Medal of Honor. After Connor’s platoon leader was killed, he led the remainder of the squad, despite several wounds, to the high ground controlling the beach where they destroyed seven of the enemy and captured 40 more. The resistance for the 7th Regiment’s Battle Patrol was the fiercest for the Third Division in clearing guns at Le Cap and La Vigie. This enemy pillbox on a shore road at Cavalaire was one of the obstacles. Seven waves went ashore at 0850, amphibious tanks stopped a German counterattack and Gen. O’Daniel came ashore at 1040. With the Cavalaire beachhead secured by two battalions of the 7th Regiment, equipment and supplies were methodically offloaded. Due to a lightly fortified coast, more men splashed ashore at H-hour in southern France than in Normandy two months previous. The worst of the fighting was dealt to the 36th Infantry Division. An estimated 75,000 German soldiers manned a thin line of defense in the assault area. Third Division officers led by Brig. 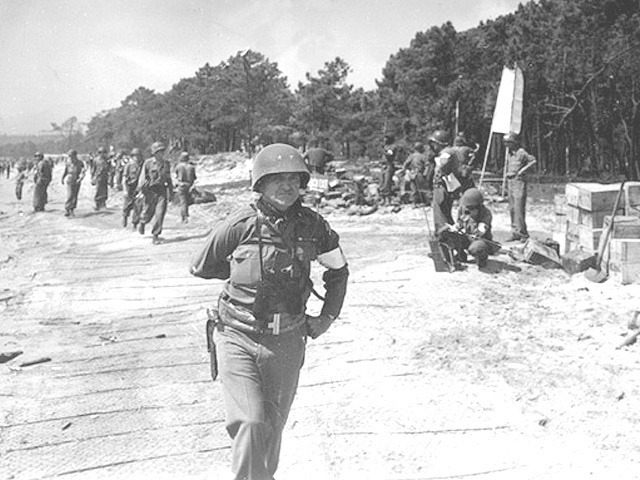 Gen. Whitfield P. Shepard, assistant division commander, observe progress on Red Beach. Hitler’s command on August 16 — known to the Allies through its intelligence intercepts — was to evacuate all but coastal elements of Army Group G from southern France. One of four DD (Duplex Drive) tanks from the 756th Tank Battalion attached to the Third Division exits the water at Red Beach. A canvas flotation apron was attached to a welded boat-shaped platform on a Sherman tank to make the DD buoyant with a 4-knot water speed from two aft propellers. Major General John W. O’Daniel takes command of the beachhead near St. Tropez. O’Daniel, appointed division commander at Anzio, led the Third Division through France, into Germany and craftily directed the division’s capture of Berchtesgaden at the end of the European conflict. 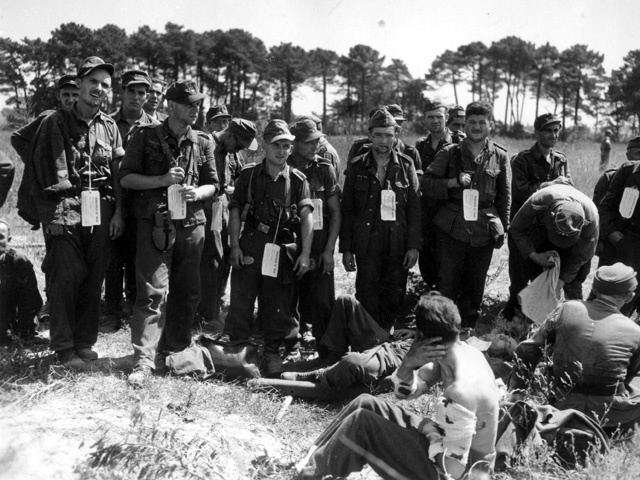 German prisoners, including wounded soldiers wait for final processing on Red Beach. In the first 24 hours, Third Division units captured more than 1,500 soldiers mostly from the 242nd Infantry Division which was later destroyed in its defense of Toulon. At the hands of the Third Division, the Germans suffered 330 killed, 1,005 wounded and 9,000 captured in the days surrounding the landings. 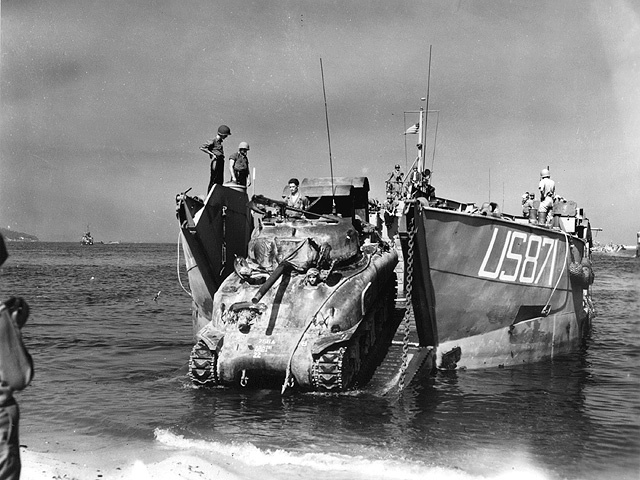 A 756th Tank Battalion B-Company M4A1 cast-hull Sherman rolls off LCT 871 at Yellow Beach. The Sherman tank carried a 75-mm gun. Made at the Detroit Tank Plant in Warren, MI. The port of Marseille with its sister port Toulon was a secondary objective of the VI Corps battle plan. French troops landing on August 16, relieved the American units at Red and Yellow beaches. The 7th Regiment’s 1st Battalion led the Third Division move along with the 45th Infantry Division to flank the cities from the north. Marseille, the largest French port and its neighbor Toulon, were assaulted by Gen. Jean de Lattre de Tassigny’s French First Army (Free French). The operation was assisted by VI Corps maneuvers that cut off the roads to the north. La Cathedrale de la Nouvelle Major, built in the 19th century. 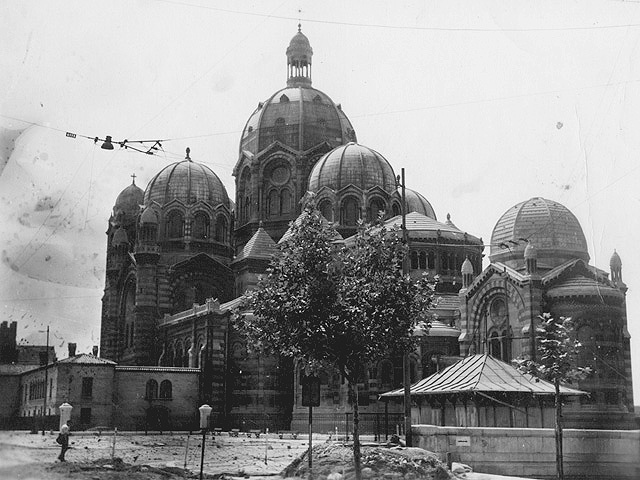 With its ornate sculptures and mosaics composed of precious stones and marbles from France, Italy and Algeria, the cathedral dodged destruction in the battle for Marseille.